Wholesale Magnifier Ruler Calculator, Personalized with Custom Imprint or Blank. Promotional, Inexpensive. Lowest cost in America. 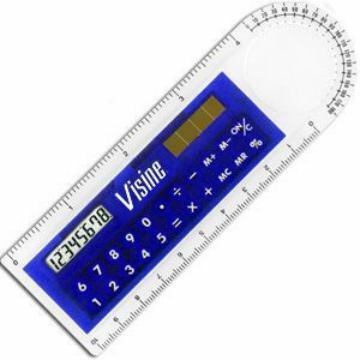 Wholesale Magnifier Ruler Calculator personalized with your logo. Plastic calculator with a 4 in. standard and metric ruler, a magnifier and a 180 degree protractor. Solar powered with a button battery backup. Budget Prices in the USA and Canada for bulk Magnifier Ruler Calculators with custom imprint. Free artwork design. US clients pay no taxes. We will send you a proof for your approval before production. Extra Imprint Colors: add $0.20 per color. Typical Production Time: 3-5 days after art approval. Blank ruler calculators ship next day. Calculator with a 4" standard and metric ruler, a magnifier and a 180 degree protractor. Solar powered with a button battery backup. Colors: Translucent Blue or Solid White. Imprint Area : 3/4" x 3/8" in front.